In 1995 Elon Musk, an immigrant student from South Africa, started a company called Zip2, which provided online city listings, the online equivalent of Yellow Pages. 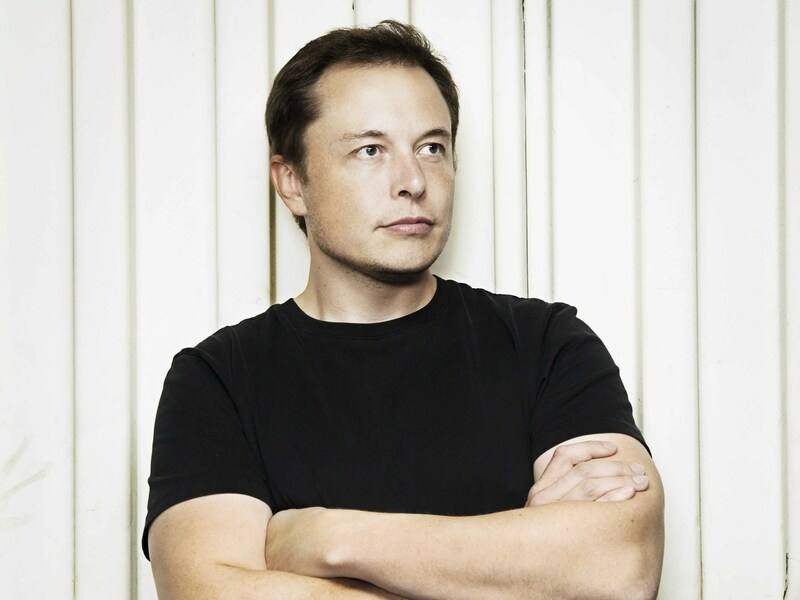 When he founded the company, Musk had $2,000 in his pocket and lived in his office. Over time, Musk obtained investors and ultimately sold Zip2 to Compaq for $307 million dollars. Then, in June of 1998, Musk started X.com, a company that revolutionized paying online. X.com later merged with another company to become Paypal, which Musk sold for $1.5 billion. In 2002, Elon Musk founded SpaceX, the first successful private space company, and Tesla Motors, the world’s first profitable car startup in 100 years. Musk is now 42 and worth $12 billion. Elon Musk’s incredible success exemplifies the beauty of free markets. It is important to define what a free market is in order to understand the beauty of free markets. Investopedia characterizes a free market as “A market economy based on supply and demand with little or no government control” (“Free Markets”). In essence, a free market is a series of voluntary, unregulated exchanges that take place within an economy. It is important to understand that a true free market is not actually achievable, but instead conceptual. This is because governments always play some role in the economy. Governments will buy and sell goods, set tariffs, collect taxes, and regulate the market. However, most economies contain some aspects of free markets. One must adopt a definition of beauty in order to prove how free markets are beautiful. Beauty is something that puts one in awe, and makes one feel breathless. Susan Sontag, an American literary icon, wrote that beauty can be something in nature, or created by man, or even something conceptual. She stated that beauty “reminds us of nature as such – of what lies beyond the human and the made – and thereby stimulates and deepens our sense of the sheer spread and fullness of reality, inanimate as well as pulsing, that surrounds us all.” (Sontag 26). She indicated that beauty can be the forces we do not completely understand. Free markets are awe inspiring due their nature-like forces. The free markets’ power “although generated by individuals’ purposive action, transcends them” (Richman 1). Beauty may also be found in the process of something being born or reborn. The English poet John Keats wrote in his poem As from the Darkening Gloom a Silver Dove about the flight of a soul to heaven: “As from the darkening gloom a silver dove Upsoars, and darts into the Eastern light … Where happy spirits crowned with circlets bright … Taste the high joy none but the blest can prove” (Keats 4-5). The poem may also be interpreted as something beautiful, the silver dove, being born from nothingness. Similarly, part of free markets’ beauty is their ability to give birth to new things. Elon Musk’s ability to create value demonstrates one aspect of what makes free markets beautiful. Musk saw the opportunity to create a car that was fully electric. He believed that an electric car did not have to be a golf cart, and his new car was the culmination of a series of inventions. Musk’s team at Tesla designed new battery arrays, and wrote code that allowed the battery to last three times as long as his competitors’ batteries. The car has no transmission, no tailpipe, and requires significantly less maintenance than gas cars. Musk hired famous designer Franz von Holzhausen to create an eye-catching design for the car, and George Blankenship, the designer of the Apple Store, to design Tesla Stores. He pioneered direct-to-consumer sales, allowing Tesla to sell cars at stores in shopping malls, and deliver the cars directly to customers’ homes. Similarly, at SpaceX, Musk used 3D printing and supercomputers to make the price of launching a rocket 320 times cheaper than the cost of a rocket launched by NASA. These innovations demonstrate the free market’s fascinating ability to give birth to new things. Just as a phoenix can rise from the ashes, a company and its products can be born. Musk was able to create something of great value that had not existed before. Furthermore, the free market encouraged someone like him to take great risks, because by taking risks, he had the potential to create something of great value. Musk said: “I didn’t really think Tesla would be successful. I thought we would most likely fail.” and “If something is important enough, you should try even if the total outcome is failure” (Pelley). The beauty of the free market is that it encourages entrepreneurs to take great risks in the hope of creating value. Free markets are also beautiful because of their ability to harness natural human characteristics for example, the competitive spirit. Humans are inherently competitive: “‘Competition is one of the most basic functions of nature. Those best able to compete within an environmental niche survive”’ (Buchanan 3). In markets, sellers compete to offer the best or cheapest products to consumers. Lets say I was shopping for socks. I would try to find the best socks, in the color and material that I want that fits my price. However, there are lots of companies that make socks, and they have to compete with each other to create the best socks. They try to compete with each other through innovation, creating socks that are more comfortable, or last longer. Elon Musk created a car that uses alternative energy, outperforms other cars, and simply is better than his competitors’ cars. 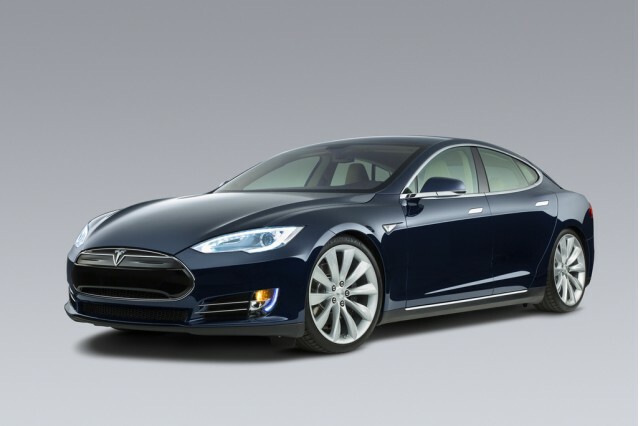 The Model S has now outsold many competing cars (“Tesla Motors Inc (TSLA) Model S Sells More Than Mercedes And BMW”). The free market also harnesses inherent human greed, the selfish human desire for something. 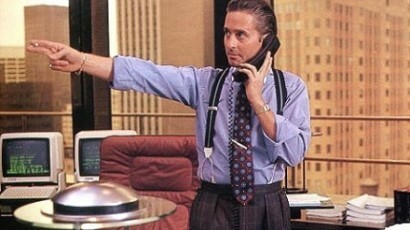 In the movie Wall Street, Gordon Gekko, a corporate raider and a symbol for rampant capitalism, said: “Greed is right. Greed works. Greed clarifies, cuts through, and captures the essence of the evolutionary spirit. Greed, in all of its forms–greed for life, for money, for love, for knowledge–has marked the upward surge for mankind” (“Wall Street”). What Gekko was trying to say, is that greed inspires us to get what we want. This is true in terms of free markets, where companies’ greed for money and success forces them to compete with each other. Although Gekko took greed to an extreme, greed is the fuel of individualism. Ayn Rand, a famous Objectivist writer, felt that entrepreneurs and creative thinkers are crucial to economic success. They should be permitted to freely create value for society without government controls. In her novel Atlas Shrugged she pointed out the importance of the selfishness we associate with greed: “By the grace of reality and the nature of life, man – every man – is an end in himself, he exists for his own sake, and the achievement of his own happiness is his highest moral purpose” (Rand 143). The beauty of the free market is that it takes greed, something natural to humans, and capitalizes on it. Free markets have an awe inspiring way of determining value. Goods are not usually priced based on their true or intrinsic value. Instead, the market value of goods is determined at a price that mutually satisfies the buyer and seller. Adam Smith first wrote in The Wealth of Nations: “The market price of every particular commodity is regulated by the proportion between the quantity which is actually brought to market, and the demand of those who are willing to pay the natural price of the commodity, or the whole value of the rent, labour, and profit, which must be paid in order to bring it thither” (Smith 59).The market price rises when demand exceeds supply, and falls when supply exceeds demand. Substantial differences in supply and demand can often lead to significant differences between the intrinsic value and the market price, also known as extrinsic value. The extrinsic value of a product can become so large that the market is forced to correct itself. In 1593, traders brought tulips from Turkey, and introduced them to the Dutch. The flowers were relatively rare, and the price was quite high. Then some tulips contracted a virus known as “mosaic” which caused flowers to have flame-like patterns on their pedals. The price of the “mosaic” tulips increased dramatically as there was extensive demand for rare types of tulips. Starting in 1634, the price of these tulips increased 2000% in one month, and some sold for more than farms and estates. Eventually, in 1637, more people decided to sell their rare tulips, due to their colossal extrinsic value. The prices of the rare tulips began to decline because of additional supply. As people became nervous, more tulips were sold at lower and lower prices. The price of tulips eventually crashed (Beattie). By the end of 1637, one could trade an onion for a tulip. The chart below documents the rise and fall of the price of Gouda tulip bulbs, one of the types of bulbs affected by mosaic. Similarly, the price of technology stocks was overvalued between 1997 and 2000. 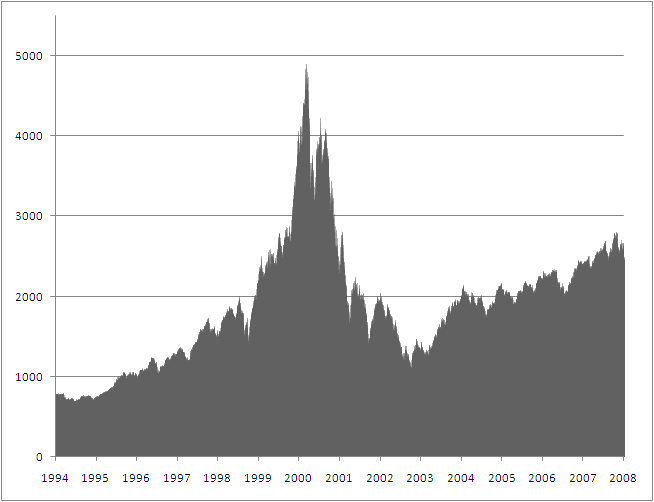 This resulted in the NASDAQ composite index (an indicator of the of the price of technology stocks) reaching an all time high of 5,132.62 (McIntire). The technology market (as represented by the NASDAQ COMP) self corrected by first crashing and then climbing to a more reasonable value. This market movement is shown in the chart below. This is another example of the markets’ natural ability to self correct. “The market is beautiful not because it lives up to some mathematically elegant equilibrium model — but because it does not! It’s beauty lies in its power to coordinate and correct errors. And it does this work without compulsion or authoritarian central direction” (Richman 1). The exquisiteness of the free market is its innate ability to adjust and self-regulate. I have been fascinated by the beauty of free markets for a long time. Free markets are beautiful because they provide opportunity for anyone, even myself, a sixteen year old teenager, to create value and wealth. As a member of the free market, I have been trading stocks since thirteen, and now trade derivatives. I play the bidding game, estimating the intrinsic value, and determining the market price for equities. I enjoy competing against millions of other traders, which has rewarded me with significant profits from my investments. I follow companies such as Tesla because of all the cool products that free markets have enabled them to create. And because I am greedy, I will stay an active and valuable participant in the economy. Natural forces, which Susan Sontag describes as “beautiful,” occur in the free market, and not only draw in myself, but billions of people worldwide.